Sometimes you can work really hard to look after your hair and it still won't stay in good condition. When previously healthy hair starts to show signs of damage or falls out, most people's instinctive response is to wash and brush it more often and increase the number of products they use. In fact, this can be exactly the wrong thing to do. Overly aggressive hair care is one of the primary reasons for healthy hair suddenly starting to decline. When hair tangles easily it can be difficult to manage, but brushing and combing it more often or more fiercely may not be the best solution. If it's tangling because it's too dry, this is likely to cause breakage. If it's tangling because it's too sticky with natural oil or product residue, aggressive combing can pull it out at the roots. You'll always lose some hair when you brush but this should only be the old hair that's already ready to be shed. Combing your hair once a day, when you get up in the morning or after you shower, should be quite enough. If you're going out in the evening, you can brush it lightly to tidy it up. If it's still tangled, inadequate combing is unlikely to be the problem. Try a detangling shampoo. Run your fingers through your hair at intervals throughout the day, to loosen knots, but make sure you don't tug at it. Most people wash their hair far more often than they need to. Only very oily hair needs to be washed once a day. Because our scalps produce more oil when we're young, we can become set in habits that are damaging later in life. Too much washing can dry out hair and rob it of its natural protection, leading it to become brittle and break. The ideal frequency of washing varies for each individual, but you should aim to wash your hair less frequently as you get older. Washing it just once a week is usually adequate to protect it from environmental damage, so anything more is just cosmetic. If your hair is dryer than it used to be, you can also try washing it in slightly cooler water to minimise the stress it is subjected to. Too much shampoo, especially if it's rubbed in aggressively, can damage fragile hair. An allergy to one of your products – even one you've been using for years – could be causing the damage. 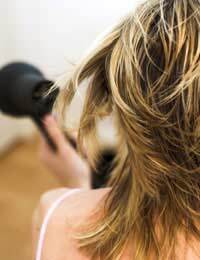 Too much conditioner can leave residue that smothers the scalp, leading to infection. The wrong type of shampoo or conditioner can directly damage your hair (see our article Shampoos For Hair Loss). Instead of simply using more of what you have, it's better to think about changing your products. Try a mild, hypoallergenic product like Johnson's baby shampoo and see if your problems persist. Don't just choose shampoo or conditioner based on price or scents you like – make sure it's right for your hair type. These days there's a huge range of special products available to help protect your hair against damage by the elements. If you spend a lot of time outdoors or in other situations that can be hard on your hair, these can be a good idea, but again, overuse can be a problem. The compounds found in some popular products can lead to the development of allergies over time so it's best to use them only when you really need them. Overuse of protection products can also be a problem because what's good for your hair isn't necessarily good for your scalp. Scalp damage can cause serious problems, especially if you have thinning hair. If you suspect this is a problem for you, try to find alternative ways of protecting your hair, such as wearing a hat on sunny days. It's natural to want to pay extra attention to your hair if you're worried about losing it, but sometimes the best thing you can do is to step back a bit and let its natural defences do their job. Once you have established its minimum care requirements you can work from there to find a balance that keeps it in tip top condition. There are many effective choices when it comes to natural remedies for hair loss. Find out more in our article Natural Remedies For Hair Loss. I am wondering about long term affects of silicone and hair loss, does it cause clogging of hair follicles and also dry out your hair. Also long term affects if Olaplex, they seem to act like it is a miracle hair repair. Some hairdressers say using allows them to lighten hair color faster without damaging hair. When I tried to find out more information it says it's not a silicone, but it appears to be some type of polymer that is supposed to absorb into the hairs cortex permanently and it's supposed to smooth hair cuticles. I am very skeptical of this it claims to be good for your hair, it even says it doesn't build up because it penetrates the cortex and improves more with each use. I wonder now that it has been on the market for a while if people are having trouble with it. How can your hair get moisture if it has this polymer in it, that stays in the hair until it grows out.